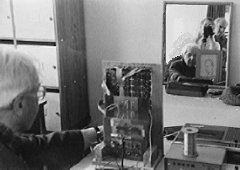 The Association was formed to shed fresh light on the Television systems used by John Logie Baird , and others, following on Baird's original demonstration in January 1926. Why are we interested in an old TV system which used only 30-lines and gave very crude results when it was first broadcast in 1929? It is a fascination with the early history of a communication phenomenon which has moulded our lives during the last 70 years. It is a sense of curiosity to see what sort of results those early experimenters might have achieved with the materials and components which we have today. It is a sense of pride that we in Britain were the first to have a regular service of broadcast television. The Baird Company transmitted 30-line Television from 1929, and on Aug 22nd 1932 the BBC inaugurated the world's first public television service. This eventually closed down on Sept 11th 1935. Technical advances had made possible a much improved TV service using 405 lines and this was started in 1936. (This was the first high-definition television service in the world.) 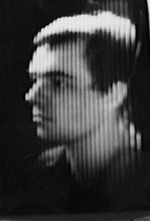 The original 30-line service could show close-up pictures of faces in reasonable detail, but wider or long-distance shots had a low entertainment value.This was the era of the television experimenter, as a television receiver could be built with the minimum of apparatus and there was considerable satisfaction in receiving any sort of picture. "Seeing by wireless" was an incredible new experience, and reception was possible over a huge area of Western Europe. Modern electronics, which can generate colour pictures of 625 lines or more enables us to update the original Baird system and produce 32 line pictures which equal, or surpass, the pictures of the early 1930s. Having said that, the beauty of the subject lies in the fact that mechanical scanning can be used and this brings in members who have special skills in optics, mechanical engineering and general mechanical construction. 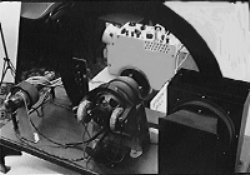 Mechanical scanning devices which can be used include the Nipkow disc (shown above), the drum, the mirror drum, the mirror screw, oscillating mirrors and combinations of these. The camera usually has a lens to form an image which is then scanned and the light passes through to a photocell which generates the electrical signal. An alternative method is to project a "flying spot" of light on to a subject in a darkened room and use a bank of photocells to pick up the reflected light. The receiver A similar mechanical scanning method can be used for display purposes; a modulated source of light can project a "flying spot" on to a screen where its scanning action will build up a picture. The simplest device is the Nipkow disc which has a spiral of holes near the edge. On rotating the disc this spiral scans a small area and if a modulated light source is behind the disc, the viewer at the front will see a picture. Electronics Mechanical scanning devices can benefit from modern electronics in several ways; amplifiers can be designed to suit the particular requirements of the photocell being used; the use of operational amplifiers will allow the DC signal level to be preserved; and special circuits will allow the motor speed and phase to be controlled accurately. Arrays of light emitting diodes have been used to simulate the original "flat plate" neon lamp, and have even served as a large screen display device. There are plenty of opportunities for experimentation in NBTV; no one has yet used a CCD camera for NBTV purposes although vidicon-type cameras have been constructed. Another avenue now being explored is the use of a computer for signal processing and display. Grant Dixon demonstrating LED matrix display.. The NBTVA has adopted a standard of 32 lines with vertical scanning. The scanning starts at the bottom right corner and finishes at the top left corner; this is the same as adopted by J.L.Baird. His pictures had an aspect ratio of 3 : 7 which is rather too tall and narrow so we are using a ratio of 2 : 3. In addition we use Phono plugs or 3.5mm jack plugs for the interconnection of members equipment. Following standard television practice a sync pulse of "blacker than black" signal is sent at the end of each line except the end of the 32nd line where the absence of a sync pulse is used to reset the frame scanning. At the 1997 Convention Don Mclean brought along two computers to show his work on the Baird 'Phonovision' record made in the 1920s and also the record of the Astoria Dance Troupe made in 1933. My personal first impression of this latter was that it was much better than I had seen when it was demonstrated on the 'Tomorrows World' programme. This is one instance when a still picture would not give a good impression, it is only with the movement that the full picture content is observed. Later Don has located some more early recordings which promise to be extremely interesting.